Provide comfort for the family of Samer Kashat with a meaningful gesture of sympathy. Your life was a blessing...Your memory a treasure..
Dear family and friends... our community lost a loved member Samir Mansour Kashat at his house surrounded by his family and friends..
Nada Karem, Fadi Kashat, Susan Hakim, Ban Dado, Sandy Sitto, Rasha Kesto, Evan Mansour and late Amal. 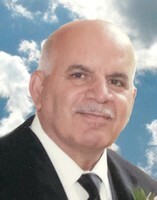 To send flowers in memory of Samer Mansour Kashat, please visit our Heartfelt Sympathies Store. We encourage you to share your most beloved memories of Samer here, so that the family and other loved ones can always see it. You can upload cherished photographs, or share your favorite stories, and can even comment on those shared by others. Provide comfort for the family of Samer Mansour Kashat by sending flowers. May the family of Samir Mansour Kashat please accept my sincere condolences hoping you find comfort in God's words at Acts 24 : 15 and Psalm 37 : 29.